Pregnancy has really made me re-think a lot of my eating habits and options. It’s given me a renewed energy to cut out the bad and add in the good…especially since there’s a little one inside of me getting all of his/her nutrition from what I eat. One of the ways I’ve been trying to incorporate better, healthier foods into my diet is by simply changing my lunch habits. Our lunch habits vary a lot. Sometimes I’m at school, sometimes work at the ironworks is so busy we just have to grab something quickly, and sometimes people invite us out to eat with them. Mostly, though, I get the opportunity to go home during lunch and eat. A lot of times, Andy has a lunch meeting that prevents him from eating with me. Thus, lunch becomes the perfect time to try out new foods and make better choices. 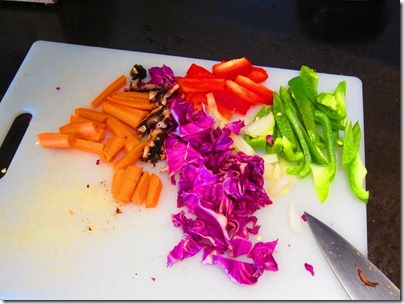 Lots of veggies—Use whatever you have on hand, but try to use as many colors as possible. 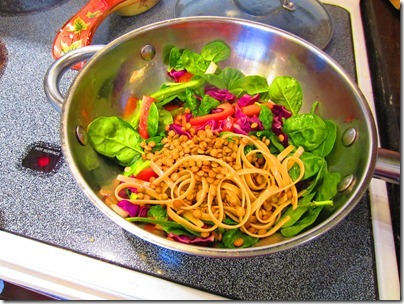 Typically, I throw in carrots, red cabbage, spinach, mushrooms, onions, and bell peppers. If I have any, canned pinneapple also makes a great addition as well. Some kind of grain or protein—My personal favorite is lentils, because they’re packed with protein and fiber, and they’re quick. Really, though, you could use anything from quinoa to cooked beans. If my hubby is around, I usually will throw in some kind of meat. By myself, though, I stick to a strictly vegetarian stir fry. Either Soba noodles or whole-grain spaghetti or fettuccine noodles—These aren’t necessary but I really like having noodles in my stir fry. Low-sodium soy sauce—I personally prefer Braggs Liquid Amino, if you can find it. It has very low sodium, excellent taste, and tons of extra nutrition. Rice vinegar—If you don’t have this, use white vinegar. Crushed red pepper flakes—Always save those leftovers from takeout pizza! Maple syrup—Or brown sugar, or honey. This is optional too, but it adds a hint of sweetness. 1.) First, you want to cook your protein and your noodles, if you haven’t already. 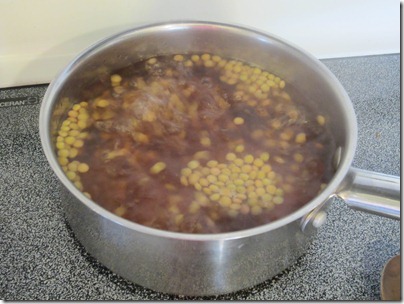 Usually, start a small pot of water with the lentils already in it (about 1/4 cup per person). 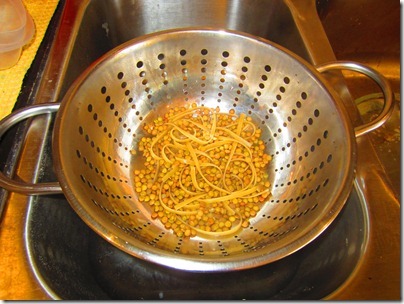 Then, when it starts to boil, I add my spaghetti or fettuccine noodles right in with the lentils. If you’re using meat, you could stir fry that first. 2.) 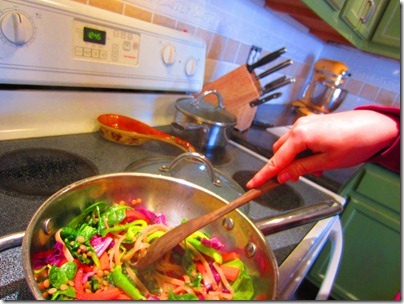 While the lentils and noodles are cooking, heat up a stir fry wok or frying pan with a small amount of oil. While it heats, cut up your vegetables. I don’t dice them or anything. They’ll usually cook up just fine…plus I like them a tad bit crunchy. Add as many vegetables as you can take…they’re great for you! 3.) 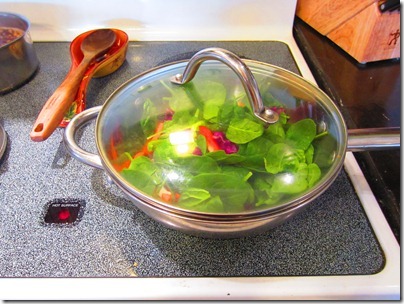 Once the pan is ready, add all your vegetables in. I cook everything together because, again, I’m not picky about all of the veggies being done exactly. Plus, it’s way faster. 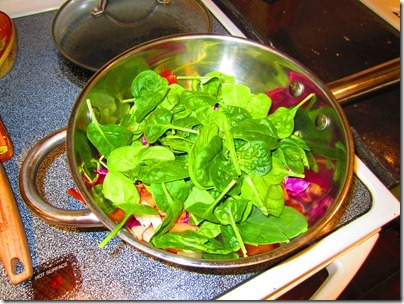 I even add in my spinach (use a ton…it cooks down) in with them as well. You could also use kale or any leafy green. Pack in that folate! 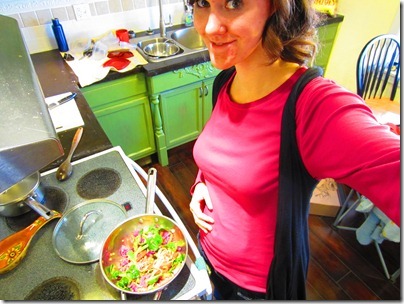 Stir the veggies in, cover, and let them cook! 3.) 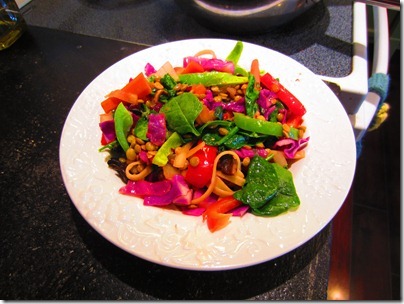 Once the veggies are nice and tender (or you just get impatient), add your noodles and lentils in. Cover and let everything cook and meld together. This shouldn’t take more than a minute or two. 4.) While everything is finishing cooking, make your sauce. Because I usually make this just for myself, I make the sauce in the bowl I’m going to use. That way I don’t miss any yummy goodness! All you do is mix together about 1/2 tsp. cornstarch, 1/2 tsp. ground or grated ginger, 1/2 tsp. 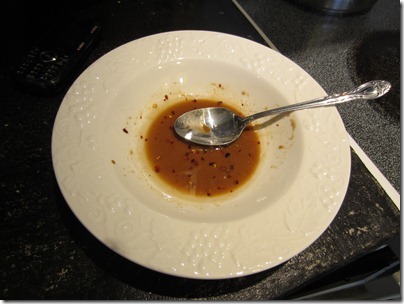 crushed red pepper flakes, 1 tsp. vegetable oil, 1 tsp. maple syrup, 1 tsp. rice vinegar, and 1/2 tbsp soy sauce or liquid amino. (This is per serving, of course). If you used canned pineapple, add a little of that juice too. You really can add anything you want. Try orange juice, peanut oil, or some kind of spice or seasoning. It’s hard to mess this up! 5.) 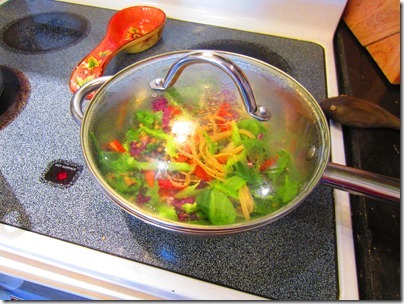 Once the veggies and noodles are ready, turn the heat off and add the sauce, just for a minute to warm it up. Be ready to salivate because it smells so good! I blame the baby for making me so hungry! 6.) Now’s the best part…eating it! Doesn’t that look delish? The best part is it only takes about 20 minutes to make! You could even make it in the morning and heat it up for lunch…so simple! And filling, seriously. I’m never hungry after eating this. Try experimenting with different veggies that are on-sale and see what you think! ← Baby B Ate My Cookie! I made this for dinner tonight. It was fabulous! I LOVED the sauce (although it was quite spicy for Henry, it was perfect for me and Leo…next time I'll cut back on the crushed red peppers). I used: broccoli, green onions, carrots, red peppers, and kale. I also cooked quinoa in vegetable broth and mixed some of it in with the vegetables and used the rest as a side. I pinned it and it's already been repinned 15 times! You're going to be famous, Caitlin! 😉 Thanks for the inspiration.